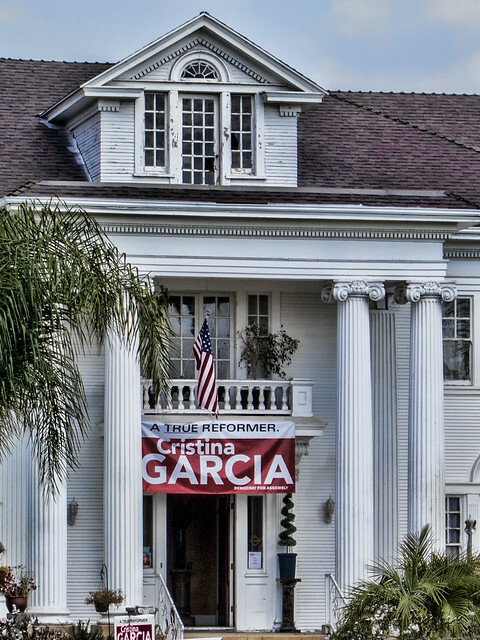 In this week's primary election, Cristina Garcia received enough votes to advance to the general election in November. But I wasn't really thinking about that when I snapped this picture a couple of weeks ago. Instead I was thinking, doesn't the Rives Mansion balcony just beg for a beautiful couple standing there waving to the crowd? I had visions of the President and First Lady. Or the Royal Couple after the Royal Wedding, giving the Royal Wave. Or maybe just the present owners on a quiet evening?